We call it the "COFFEE BEAN." 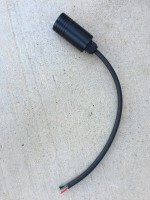 This is used in the connector when adding an adapter or extension to a Tesla 2nd Generation Wall Connector or Destination chargers. This circuit is connected in parallel with the original pilot wire and is designed to pull the pilot down to 9V so that the EVSE's will show them as connected and then when you plug the adapter or extension into the car it will bypass and the cars charger takes over. The green wire is connected to the ground lug. The Purple wire is connected in line with the Pilot wire. 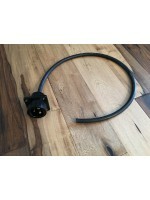 Female Tesla compatible (UMC) socket can be used in place of the standard J1772 socket giving you the ability&nb..
New Product on the Market…Female Tesla compatible (UMC) connector that can be used to build a Tesla to J-1772 convers..
NEW DESIGN..... Updated design where all of the parts of the connector screw together rather than glued.Female T..